As the victorious President-elect Emmanuel Macron appeared in front of Le Louvre to address the Fifth Republic, it was conspicuously to the strains of Beethoven’s ‘Ode to Joy’ – the EU ‘national’ anthem – rather than to ‘La Marseillaise’, France’s revolutionary anthem to liberté, égalité, fraternité. For Macron, l’esprit de la nation dwells much more in l’Europe than in la Patrie, and that means le jour de gloire isn’t going to arrivé any time soon. Sorry to put a dampener on things, but becoming France’s youngest leader since Napoleon is a nice media refrain, but fresh faces and optimistic drivel don’t create national unity or forge reconciliation. He can spout all he likes about serving France with humility, strength and love; and he can pledge ad nauseam to unite his fractured country with his neither-left-nor-right enlightenment therapy. But this is just Blairite ‘Third Way’ Eurovision: 34% of voters supported Marine Le Pen’s Front National (including 44% of young people), and that’s a rather respectable result for the far-right Holocaust-deniers and anti-Semitic revisionists. Hillary Clinton might believe Macron has saved France, Europe and the world (yes, really), but this is a shallow political salvation. France has a shooting-star president who is defined in the popular consciousness more by what he is not than what he is: the anti-Le Pen. 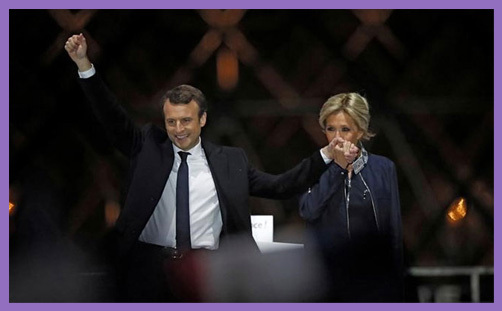 He doesn’t only have to persuade her 11 million supporters that he has heard their “anger, anxiety and doubts”, he has to convince the 12 million sons and daughters of France who abstained along with the 4.2 million who spoiled their ballot papers that he is more than a garlic-infused French kiss. And that’s going to be difficult. Macron is an establishment énarque; a former multi-billion-euro investment banker, political advisor, and finance minister in President Hollande’s government. He rails against the self-serving elite, but he is one. He derides decadence, but swims in it. He despises populism, but rides it. He feels for political disenchantment, but helped cause it. He vows to shake up the system, but he is the embodiment of it. He blasts the democratic deficit, but seeks to perpetuate it. He broadcasts transformation, revival and revolution, but it’s just more Europe, more ever closer union, more of the same. France has elected the lesser evil in En Marche!, but Marine Le Pen’s Front National isn’t going to go away. A transcendent movement for change which promises change must deliver change, or today’s 44% of disenchanted youth become tomorrow’s revolutionary 80%. And they won’t easily forgive the soothing rhetoric of tenderness and trust when their friends are having their eyes gouged out in the next Bataclan battlefield. That’s when the ‘Ode to Joy’ will be drowned out as l’étendard sanglant est levé, and ces féroces soldats will descend to égorger vos fils, vos compagnes. You can’t unite France if you’re in denial: a faux revolution of ‘more Europe’ is just storing up Le Pen for another day.